I was recently contacted by Joy Forbes, author of a local history book on one-room schoolhouses in Ontario called Perseverance, Pranks, and Pride: Tales of the One-Room Schoolhouse. Local historians, like Forbes, work all across Canada producing fascinating histories of their communities. This one, in particular, caught my eye because of her companion website, which she uses to post additional content and seek out new oral history sources. Sean Kheraj: What motivated you to start the www.oneroomschoolhouses.ca project? Joy Forbes: As president of the Canadian Federation of University Women in Kanata (CFUW/Kanata), I met a group of women from the Sherbrooke Club who had written a book called “Days to Remember” about one-room schoolhouses in the Eastern Townships. One of the mandates of CFUW is to promote education. These women encouraged members to record oral histories of people across Canada. At first I was only going to interview teacher, as I have been a teacher for 33 years; however I soon learned that the students had the best stories! Our Canadian history needs to be recorded before people pass on. SK: Through your research, what has surprised you most about the history of these schools? JF: I grew up in Montreal and Quebec City and only thought one-room schools existed in pioneer days. I am amazed at how many one-room schoolhouses still exist. Many have been changed into homes, churches, community centers, pubs and libraries. The last one in Ontario closed as a school in 1992, although most schools closed in the Ottawa area between 1963 and 1967. I have interviewed people only in their fifties and well as those up to 100 years of age that can clearly recall life in a one-room schoolhouse. Through my research, I discovered Bishop Mountain set up the curriculum for schools in Quebec and Ontario in the 1850s. I was surprised to find books in a one-room school outside of Perth, Ontario that I remember I had in a Montreal city school in Quebec. SK: How do your interviewees remember these places? Were they fond of their experiences or were they critical? JF: Most interviewees have fond memories of their schooling. Many have lasting friendships to this day. Some are fiercely proud of the education they delivered and received, while others confessed they didn’t learn very much. In many schools, there was discipline of fear through the use or threat of the strap. Learning disabilities were frequently not diagnosed (e.g. dyslexia) and often students left after Grade 8 or when they turned 16 years of age. As today, so much depended on the teacher. SK: What impact did these schoolhouses have as cultural institutions within Ontarian communities? JF: One-room schoolhouses became the central hub of rural communities. Many community events centered around the school. At Christmastime, everyone in the community congregated at the school for the annual Christmas concert. 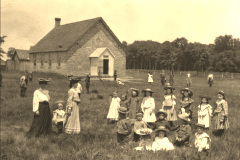 In the spring, there were often community picnics to celebrate the end of the school year. During the year, mothers would bring their pre-schoolers to school to get inoculations from the doctor if he was in the area. School-aged children would be measured, weighed and have their eye sight checked too. Once a month, a traveling library brought books and National Film Board movies that were shown at the school. This was a popular event and a privilege for students to attend. Teachers were community leaders who taught students reading, writing and arithmetic; who disciplined children when they didn’t follow the rules or when the pranks became too outrageous; and who prepared their charges to deal with structured career paths (e.g. farmers, teachers, nurses) and rural community life. “Early to bed and early to rise makes a man healthy, wealthy and wise” or “The early bird gets the worm” were common pieces of advice given to achieve success. SK: In what ways did these schoolhouses as community institutions shape education in Ontario? JF: In the early days, in all Ontario schools, students were taught religion from the Christian perspective. Mottos such as “Do unto others as you would have them do unto you” and “Honesty is the best policy” reflected some of those values. Students would memorize passages from the Bible or a few lines from Shakespeare such as “There is nothing so kingly as kindness; There is nothing so loyal as truth.” Other proverbs like “A stitch in time saves nine” and “If at first you don’t succeed try, try again” are still used to encourage hard, diligent work. In today’s multicultural society, children are also taught respect, tolerance and appreciation of cultural, religious racial and intellectual differences. The role of a teacher has always involved many challenges. Despite the drastic changes in society, teachers have always been important figures in children’s lives. On a daily basis, teachers continue to have profound influence on their students. SK: How can people get in touch with you to share their experiences in one-room schoolhouses? JF: People can email me at joy.forbes@sympatico or contact me through my website www.oneroomschoolhouses.ca. This is so interesting and great. Thank you for all your hard work. I am a retired teacher living in Nova Scotia. I am very interested in locating one room school here. How do I start?